It was standing room only in the newly refurbished Wakefield Cathedral on 23 November 2013, the Eve of the Feast of Christ the King, for an inspiring event called The Vision Glorious. Gathering together Catholic Anglicans from across the region, The Vision Glorious was an opportunity to give thanks for the faith we have received and to re-commit ourselves to live out that faith in the future. The Principal Celebrant was The Right Revd Glyn Webster, Bishop of Beverley. Glorious Music was led by a choir gathered for the occasion and there were special children’s activities to ensure that all ages could participate in the event. Reflecting upon the Kingship of Christ, Bishop Tony said, “What we do know is that Jesus’ unfailing witness to the truth marks his true kingship. As his subjects, we will be judged on how we have witnessed to his truth, his love, his way.” He therefore encouraged Catholic Anglicans by way of The Society to commit to a vibrant catholic traditionalist wing which continues to add something to the life of our Church. Following mass Dr Colin Podmore, Director of Forward in Faith, addressed the assembly. He reflected on the legislative package regarding Woman Bishops which earlier in the week had been debated by the General Synod of the Church of England. Speaking after the recent publication of a letter from the Bishops of the Society to its supporters, he clarified the vision for the Society and explained the relationship between it and Forward in Faith. 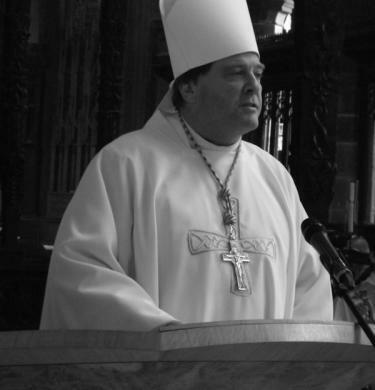 He urged the assembly to support the bishops and help “the Society to grow and flourish as the ecclesial structure that will enable us to live and breathe and flourish within the Church of England”. The organisers of The Vision Glorious are very grateful for the gracious hospitality provided by the Dean and Chapter of Wakefield Cathedral which enabled the event to run so smoothly. Today the Bishops of the Society sent a letter to the supporters of the Society. The Catholic Movement continues to foster vocations to priestly ministry in the Church of England, through the God Calling initiative. Men who are currently exploring priestly vocation are invited to attend a Vocations Day to be held at Christ the King, Gordon Square, on Saturday 30 November 2013, from 10.30 am to 3.30 pm. Wives are invited to accompany their husbands. The programme will include keynote addresses on Anglican Identity and Anglican Spirituality by Dr Colin Podmore and the Bishop Jonathan Baker, and a Bible Study led by Bishop Norman Banks. Those wishing to attend should contact Fr Darren Smith for further information and bookings: fr.smith@additionalcurates.co.uk - tel: 0121 382 5533. The bishops of the Society warmly support this event.